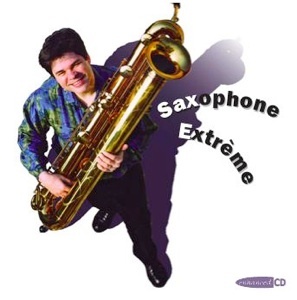 This CD was conceived at first as a means of discovering the tubax, this small contrabass saxophone model worked out by Benedikt Eppelsheim in 1999. It thus tries to investigate all the possible registers in which the instrument can express itself : specific original works for tubax (Fournier), for contrabass saxophone (Monnet, Stroë), for low instrument ad lib (Scelsi), for unspecified saxophone (Bonneau), jazz (Couderc) or free improvisations (Bertocchi), and even transcriptions (Bach) or an electroacoustic work realized with tubax sounds (Toeplitz). The Cerberus always reaches ahead. It's not amazing that the Greeks represented him with 3 heads. In the XXIth century, as far as music is concerned, 7 saxophones are not enough for him. He wants 8, if not 9. He turns then to the German maker Benedikt Eppelsheim and so becomes the ambassador of the Soprillo (sopranissimo saxophone) and the pioneer of the Tubax (a contrabass saxophone completely rethought by the German maker). This CD reveals us (or confirms) the tremendous possibilities of the latter. Seizing at first the repertory of the contrabass saxophone, the Cerberus delivers us the poetic Clinamen by Aurel Stroë, Marc Monnet's Le cirque, a slapped dance, and an energetic version of Maknongan by G. Scelsi. And if that was not enough for him, he commissions new works. Entering into the spirit of the game Marie-Hélène Fournier with "Convex Black Body", certainly one of its most poignant pieces. An obsessional dance followed by a meditative, slightly reverberated section. And Kasper T. Toeplitz with his disturbing Froz*3 for Tubax sounds slowed down by the program MAX-MSP. Not content with playing these newcomers, the Cerberus improvises on 2 titles. Research of specific colors, fragmented sounds, whispers, harmonics, as to remind us his infernal origins. And if that is not still enough, he puts his instrument in the expert hands, too, of Frédéric Couderc for a demonstration of a tubax swing with irresistible riffs and a tribute to Coleman Hawkins (who had moreover begun in the Fletcher Henderson band playing the bass saxophone). And as a cd is still not enough for him, he includes a cd / CD-ROM in which we find scores and information on the tubax. A site on the tubax with much of the contents of the CD-ROM.